Moonlight Basin was a ski resort in southwestern Montana, located in the Madison Range of the Rocky Mountains in the resort village of Big Sky. In October 2013, it, along with ski terrain within the Club at Spanish Peaks, were consolidated into Big Sky Resort, making Big Sky the largest single ski resort in the United States, with 5,750 acres (2,330 ha) of terrain and over 30 ski lifts. Moonlight Basin features the extreme terrain of The Headwaters. These steep chutes and gullies on the north face of Lone Mountain, once known as the "Nashville Bowl," can be hiked to from the Headwaters lift (opened in December 2005) or Big Sky's Challenger lift, both of which unload at just under 10,000 feet (3048 m) above sea level. The resort also features terrain consisting of open bowls, tree skiing, moguls, long groomers, beginner runs, and a freestyle terrain park. A full day adult lift ticket for the first season was $39 for the 2008-2009 ski season. The Lone Peak Pass combines Big Sky and Moonlight Basin resorts and was $93 for the 2008-2009 season. The combined pass was first offered during the 2005-2006 season. The primary lift at Moonlight Basin is the Six Shooter, a high speed six pack chairlift that climbs 1850 vertical feet (564 m) from the base and is nicknamed "the flying couch." The Headwaters chairlift connects at the top of Six Shooter, rising another 685 feet (209 m), for a total lift-served vertical rise of 2535 feet (772 m) from the 7000 foot (2134 m) base. The other upper lift is the Lone Tree quad, installed in 2004 for the second season, which allows access to the glade like terrain northwest of the Headwaters. Additional lift-served vertical is attained at Moonlight Basin by purchasing the Lone Peak Pass and taking Big Sky's tram to the summit of Lone Mountain. The two original chairlifts at Moonlight Basin, Iron Horse & Pony Express, were installed by Moonlight Basin Ranch in the mid-1990s before it was a stand-alone ski area. The lifts were operated by the Big Sky Resort. Moonlight Basin now offers golf on a Jack Nicklaus-designed golf course known as The Reserve at Moonlight Basin. The par 72 layout is 7800 yards (7132 m) at an average elevation of 7500 feet (2286 m). A spa, fine dining, and a four hole short course have been added. The parent company of the ski resort, Moonlight Basin Ranch, has committed a significant percentage of its land holdings to conservation. 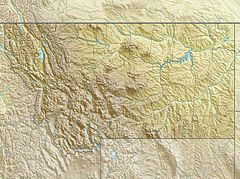 The original 25,000 acres (10,000 ha) was purchased for $6.5 million by partners Lee Poole and Joe Vujovich of nearby Ennis, and Keith Brown of Fort Lauderdale, Florida from the Big Sky Lumber Company, a real estate development company created by Yellowstone Club founder Tim Blixseth and partners Mel and Norm MacDougal. The Moonlight Basin Ranch property sale by Blixseth and the MacDougal brothers was part of 165,000 acres (67,000 ha) they purchased from Plum Creek Timber for $27.5 million earlier in 1992. With 17,000 acres (6,900 ha) sold, the remaining 8,000 acres (3,200 ha) comprise the Moonlight Basin ski resort and golf course. Poole became the sole owner of Moonlight Basin, having bought the shares of the other two partners but in 2009 Moonlight Basin filed for Chapter 11 bankruptcy protection. The reorganized property reopened in 2010 as Moonlight Basin Ranch LP but remained under bankruptcy protection while proceedings continued in Montana Bankruptcy Court with principal debtor Lehman Brothers Holdings. In 2013, the owners of Big Sky Resort (Boyne Resorts) and the Yellowstone Club (CrossHarbor Capital Partners) announced a deal to merge Moonlight Basin into Big Sky Resort, creating the largest ski resort in the United States at the time. ^ "Here's how Blixseth did it". Bozeman Daily Chronicle. Retrieved April 12, 2011. ^ "Tim Blixseth and BSL". Gallatin Land Exchanges. Archived from the original on 2011-03-13. Retrieved April 12, 2011. ^ "Moonlight Basin Files for Chapter 11 Bankruptcy Protection". Moonlight Basin. Retrieved April 12, 2011. ^ The Big Merger, by Emily Wolfe, Explore Big Sky, August 22, 2013. ^ Deal Announced to Merge Big Sky and Moonlight Basin, ABC News, August 16, 2013. ^ Deal Combines Montana's Big Sky, Moonlight Basin Into Largest Ski Resort In Lower 48 Archived 2013-11-01 at the Wayback Machine, by Mike Terrell, Sno Country, August 22, 2013. "Better Together, Big Sky Resort, MT". bigskyresort.com. Big Sky Resort. Archived from the original on 2013-10-05. Retrieved 2013-10-05. This page was last edited on 31 January 2019, at 09:07 (UTC).